Pharma mix 1 is a mix of three time-tested drugs: testosterone cypionate, boldenone, and testosterone phenylpropionate. 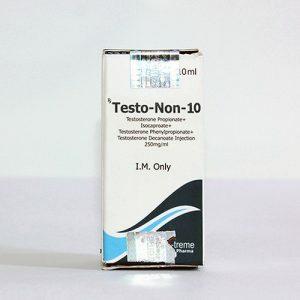 Mix 1 is produced by Pharmacom, which has proven itself from the best side, at least the injection steroids of this company have a positive reputation on our site, which is confirmed by customer reviews. The use of a combination of several active components, different in their properties, in one preparation allows to obtain a synergistic effect. Those. 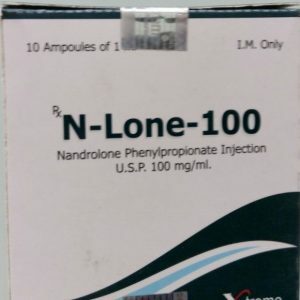 First, the shortest ether from the composition is switched on – the phenylpropionate test, cypionate is further connected, and at the finish line the longest boldenone, which allows maintaining the necessary concentration of the active substance in the body without jumps and subsidence. How to take Pharma Mix 1? This mix is ​​great for building muscle and increasing strength. It can also be used to stimulate appetite, to increase stamina and energy, and for other reasons. 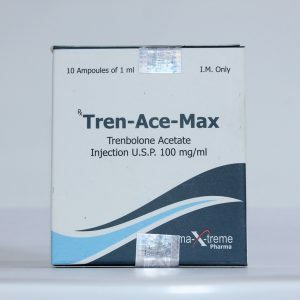 The dosage of Pharma Mix 1 recommended for use on the course is 450 – 900 mg. Because of the smooth, and most importantly, long-acting (activity time – up to 16 days), the drug is usually administered once a week. The average duration of the course with his participation is 6-8 full weeks. During this period, with training and proper diet, you can achieve an increase in muscle in the amount of 6-8 kilograms. Note that for the introduction of the recommended dose of Pharma Mix 1 (450-900 mg per week) you need only 1-2 ml of the drug, respectively, 1 ml. – for 450 mg, 2 ml – for 900 mg. And all because this mix has a rather high concentration of active ingredients – 450 mg. on 1 ml. By the way, the nominal volume of the injection vial is 10 ml; this amount is enough for you for at least five, maximum for ten full weeks of intensive use. 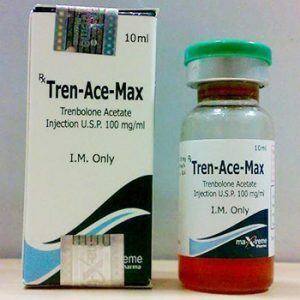 It is also important to say that on the course this drug can be used both in solo and in combination with other steroids. 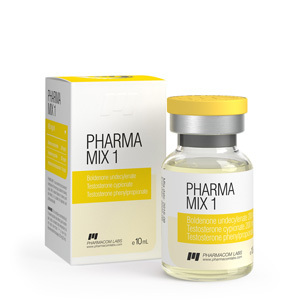 In other words, in order to achieve great results, you can combine the course of Pharma Mix 1 with taking other, different in quality and properties of preporatov. For example, to get better muscles and to maximize strength athletes combine this mix with Stanozolol (Stanozolol is used at a dosage of about 50 mg per day). Also, this mix is ​​perfectly combined with Turinabol and Methandienone (any of the preporata is used in a dosage of about 30-50 mg per day). On the course, an athlete may experience side effects. To cope with the side effects of the mix you need tools such as Proviron and Clomid.